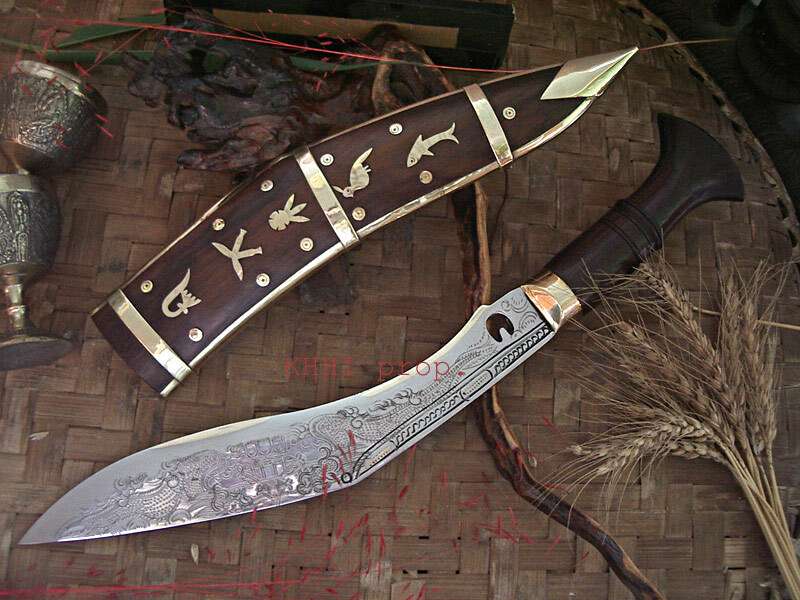 Dragon:: One of the most famous kukri in Nepal used by almost all Nepalese in their daily chores gets a new look with dragon engraving. This kukri is fascinating with dragon engrave and wooden sheath with designs, hence mostly used as decorative and gifts. Both the blade and wooden sheath is given artistic touch which depicts great talent of craftsmen. Like knife makers “kami” the dragon engravers have been making dragons from generations and passing the skill to their younger generations. They not only engrave in kukris but also in wood and stones, very talented tough engravers. Khukuri: Dhankuta is a small village located in the eastern part of Nepal and this type of khukuri is mostly made in this village. The name of the khukuri “DhanKute” is given after its village name where it originated centuries ago. Dhankute people specialized in many ornamented and decorative displayers amongst which the DhanKute khukuri is one of their prized and prestigious establishments. 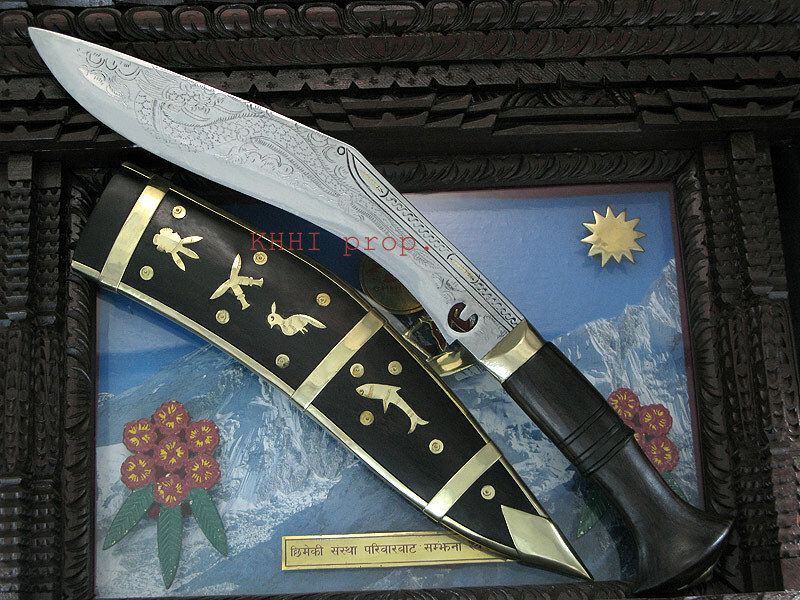 A DhanKute khukuri is basically a simple working and decorative knife but with a fancy scabbard that has Nepalese national symbols overlaid on its front panel. 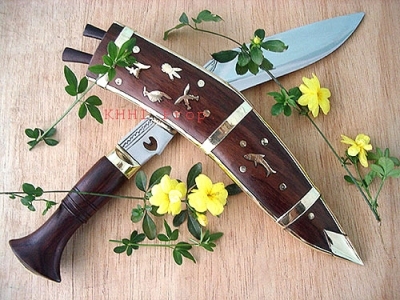 The skilled craftsmen craft special scabbard out of buffalo horn and India rosewood for the kukri blade and displays various national monograms made from expensive metallic sheets like Brass or White metal or even Silver sometimes such as king’s crown (Shree-pech), national bird (Danfe), national flower (Laligurans), national fish (Aasla), Gurkha insignia (khukuri cross), sign of a temple (Pashupati chaana), the holy sword (Trishul) etc. The basic objective is to compose the khukuri to represent Nepal and her persona. The glory, sovereignty, character, culture and people of Nepal are captured in this unique work of art by the Dhankutes. Commoners mostly use it as a decorative tool because of its elegant and delicate look therefore it is crafted more as a “Decorative” piece. The blade is slimmer and lighter than the army types. It comes in both, Chainpure and Sirupate type blades. DhanKutes are typical working knives too but since they are made for display purpose and demands to be displayed to decorate a space, DhanKutes are mostly kept in shelf or stands.